After a special police investigation team on Tuesday concluded that the 2009 crackdown against SsangYong Motors’ laid-off workers was a form of state violence and that it was orchestrated under the leadership and approval of the former President Lee Myung-bak, former SsangYong employees demanded an apology from the government. 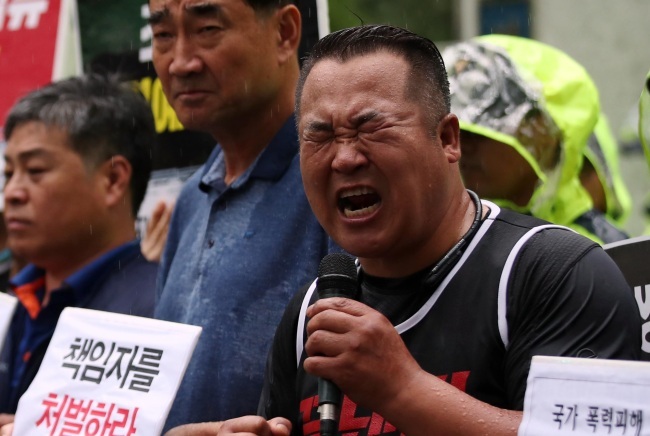 On Aug. 4-5, 2009, police raided SsangYong Motors’ union members occupying the automaker’s factory in Pyeongtaek, Gyeonggi Province, in protest of the massive layoffs that affected at least 2,600 SsangYong workers. Some 30 SsangYong laid-off workers and their spouses, some of whom were hurt by the police during the 2009 crackdown, have either taken their own lives or died of illnesses. Many suffered from financial hardships as well as trauma from the police brutality. According to the special investigation team’s report, a police team consisting of SWAT officers was dispatched to disband the workers occupying the factory, who used stun guns normally used in special counterterror missions against the protesters. The UN Committee against Torture classified the use of stun guns as a form of torture that can kill in 2007, two years before the crackdown against SsangYong workers took place in Korea, due to the acute pain they cause. The report also showed that the SWAT team fired 200,000 liters of tear gas liquid mixed with dichloromethane, a chemical classified as carcinogen in Korea, at the protesters. The special probe concluded that former President Lee Myung-bak approved the dispatch of SWAT officers and the use counterterror weapons against the civilians. The probe also found that the Gyeonggi Province Police Agency, led by then-chief Cho Hyun-oh at the time, formed a team of about 50 officers assinged to spread online video-posts and comments that deliberately exaggerated the violence committed by the unionists during the raid, in an attempt to sway public opinion against the laid-off workers. The special investigation team on Tuesday recommended the government withdraw its 1.66 billion won ($1.5 million) lawsuit filed against the unionists -- many of whom had very limited income after being laid off -- for the damage they allegedly caused to a police helicopter and other assets during the raid. The investigation unit additionally recommended police offer an apology and come up with measures to avoid similar cases from recurring. The unionists released a statement calling for the implementation of all measures recommended by the investigation team. Among the 167 unionists who have been fighting for re-employment at SsangYong since 2009, only about 20 percent have regained their positions. Some 120 of them are still demanding reinstatement.